“Muscle building” marketing tends to speak about ‘genetic potential’ and ways to overcome this potential (which if you stop and think about it is impossible). 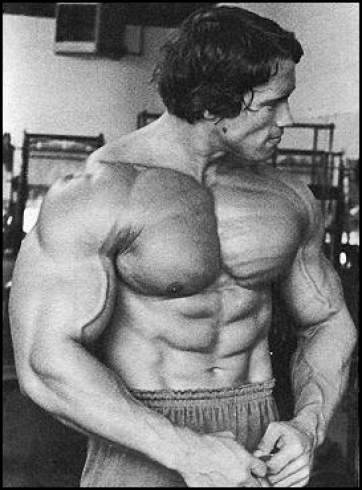 Did Arnold simply have a higher genetic potential? Or did he also have a higher lifestyle potential? It’s also largely irrelevant because it’s not your genetic potential that limits you but rather your lifestyle potential. Lifestyle factors are almost always the rate limiting step to your ability to grow bigger muscles and get really lean. The confusion for most men comes when they set their body image ideal goal/target based on a model, athlete, celebrity or bodybuilding who is living a much different life than they. You simply cannot know what the lifestyle of your model image really is…you’ll never know how much rest, stress, drugs, supplements, and training they really do unless you lived with them. This is another reason why you cannot compare yourself to anyone else besides you. In today’s podcast we talk about the blurry line between genetic and lifestyle potential and why the images of most athletes, celebrities, and fitness and bodybuilding models must be taken with a grain of salt because of the unknown lifestyle factors that come into play. You likely have the same ‘genetic’ potential as all of your image model ideals, but you probably don’t have the same ‘lifestyle’ potential. Note: Posing tutorial video will be up wed next week.